ANNUALIZED 2018 sales are $218,868 while net is $44,542!!! 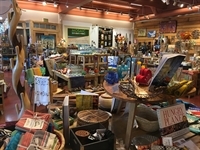 The Company is a specialty retail store offering goods from around the world that employs 1 part time owner and 3 part time staff on W2 status. The Company is located in downtown merchant area and occupies 1,700SF of space. Only five minutes from University of Oregon and easily accessible by public transportation this is an ideal shopping destination for anyone visting the college for academic or sporting events.